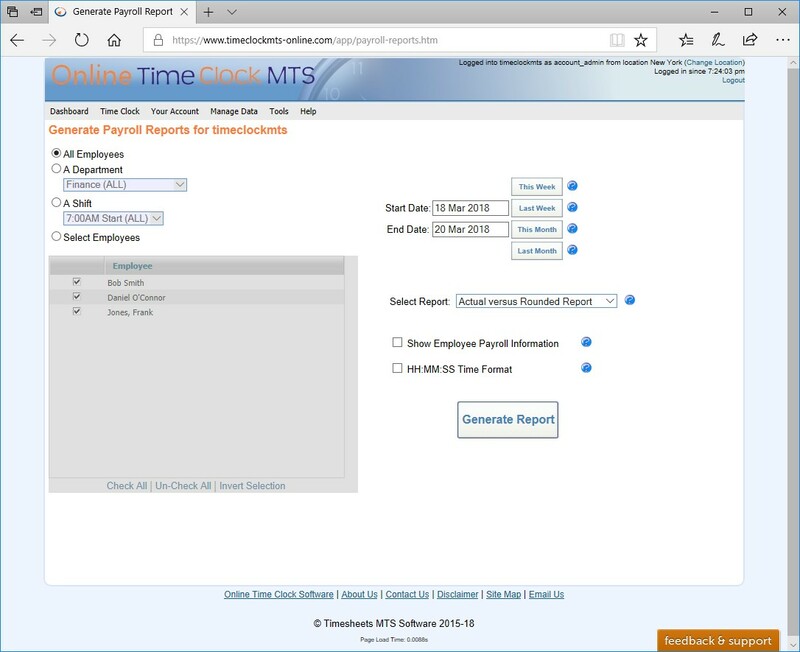 Online Time Clock MTS offers dozens of different payroll reports that will help you stay on top of you employee attendance information. 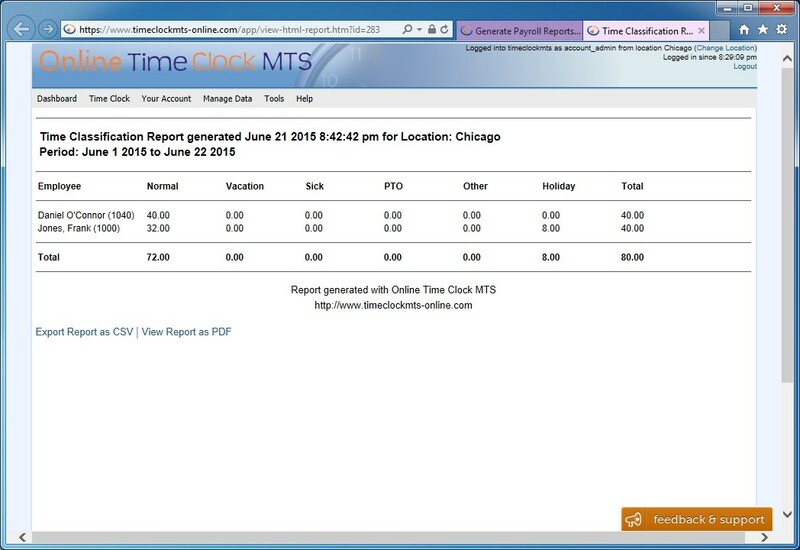 We've got reports that list off time punches, reports that give you total hours worked per day, and reports that give you detailed wages calculations. 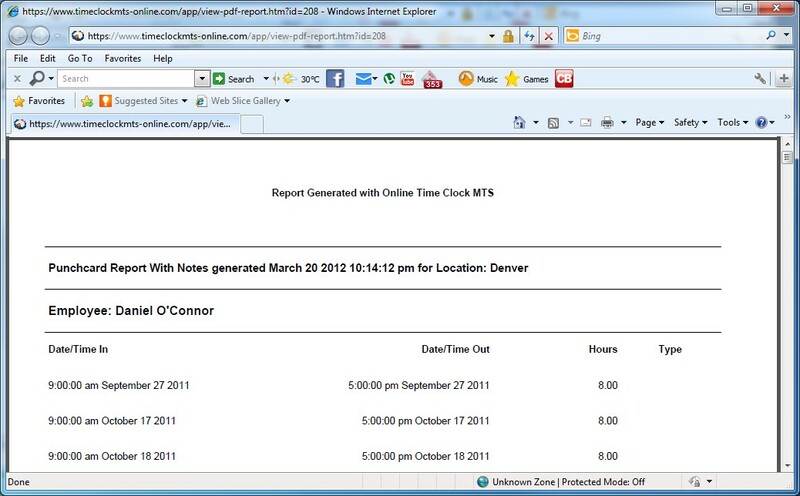 More detailed reports include job based reports that tell you how much time employees have spend working on job codes, how much sick or vacation time they've taken and got owing, and what employees have viewed and acknowledged messages shown to them when they punch in or out. 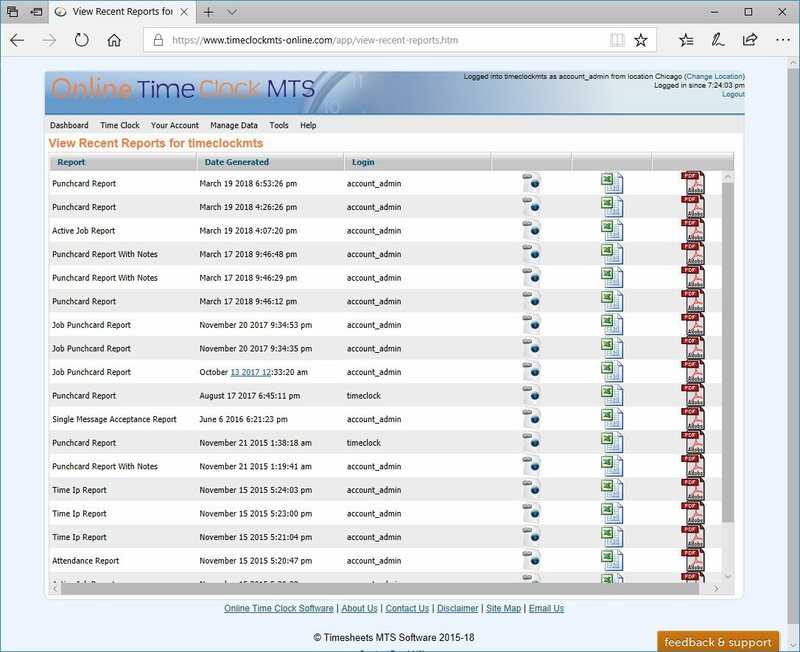 Don't forget that each of our reports can be viewed and printed in a number of different formats and exported directly to the spreadsheet program of your choice. 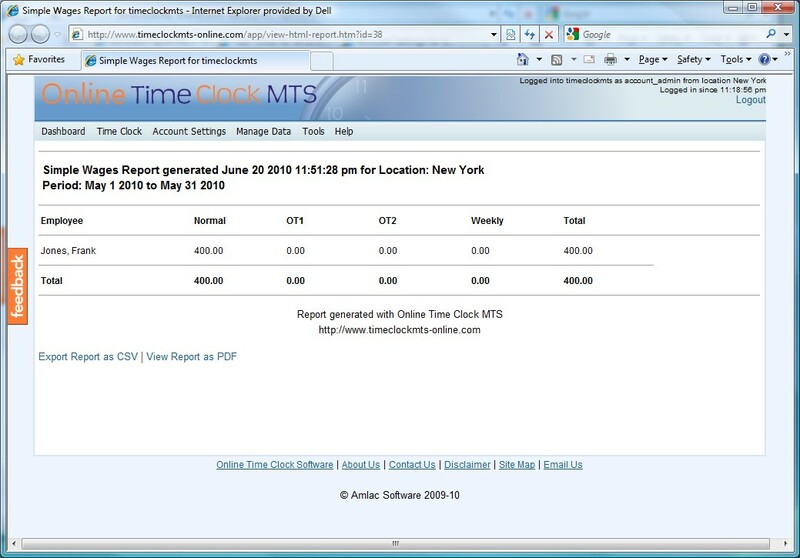 This screen is used to run the various payroll reports for employees, note that you can select the employees, date range, and the report that you want to run. 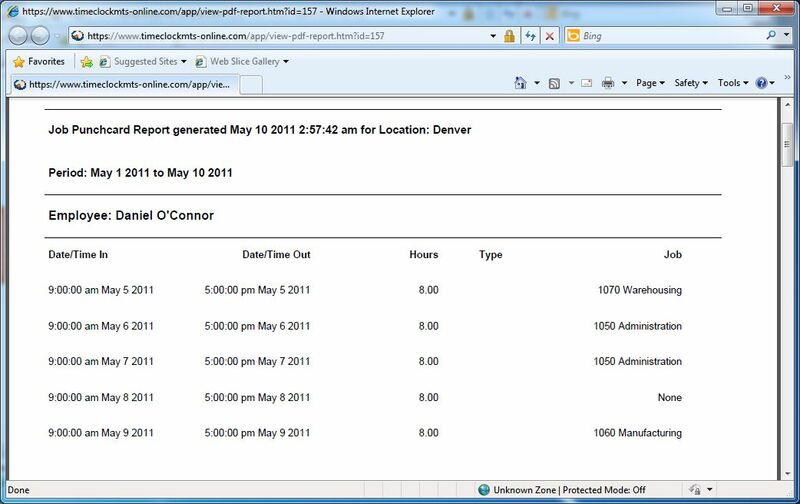 You can use this screen to view the reports you've run recently, note how you can view them in HTML or PDF and export to them to a Microsoft Excel file. 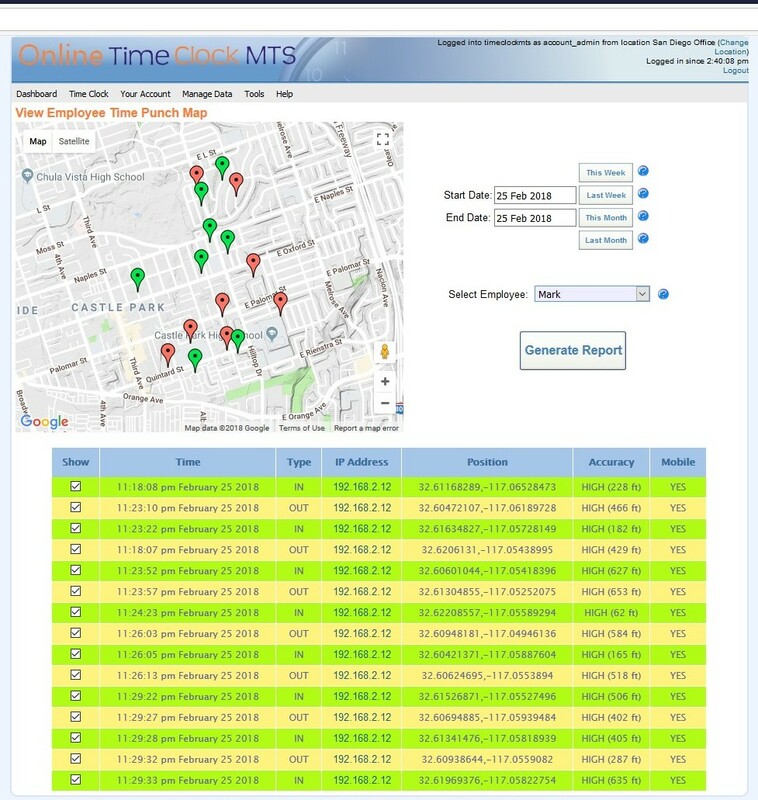 The active job report gives a list of all active jobs for the current Online Time Clock MTS location. The PDF version of the active job report. 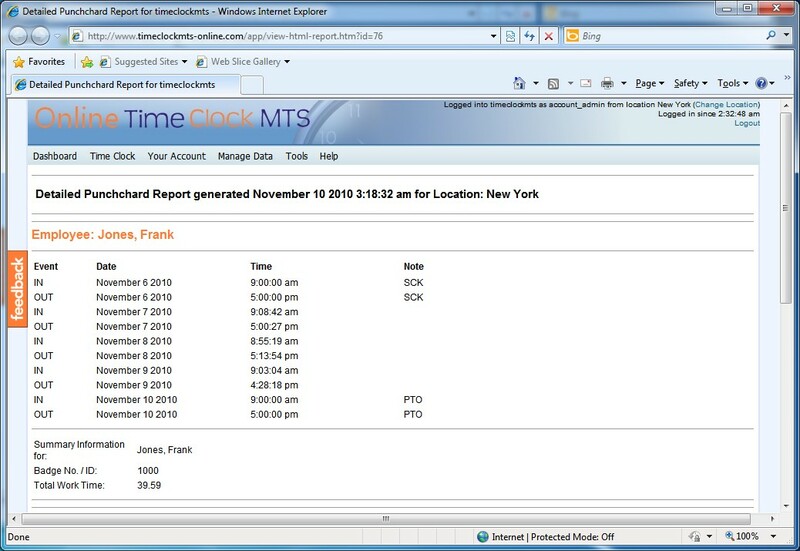 The attendance report allows you to see at a glance who is clocked in and who isn't. 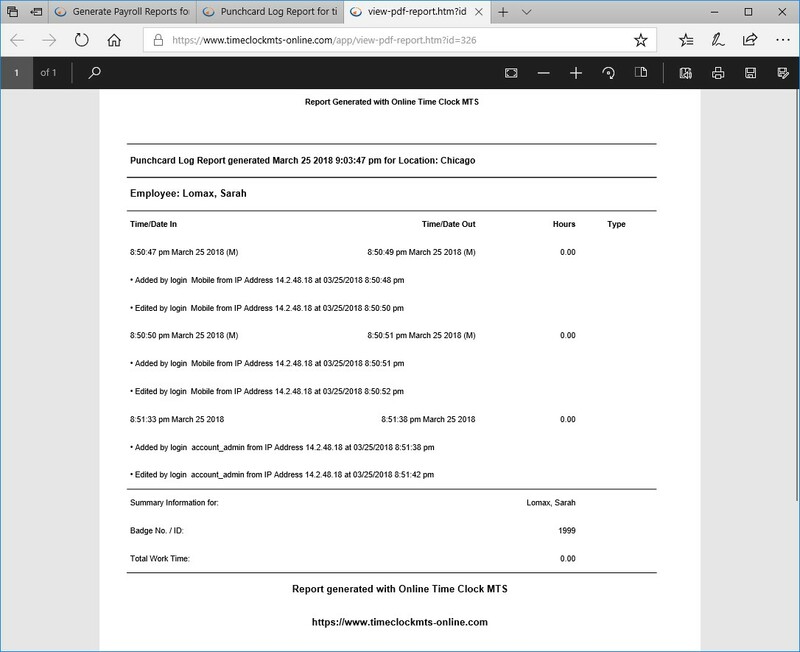 The PDF version of the attendance report. 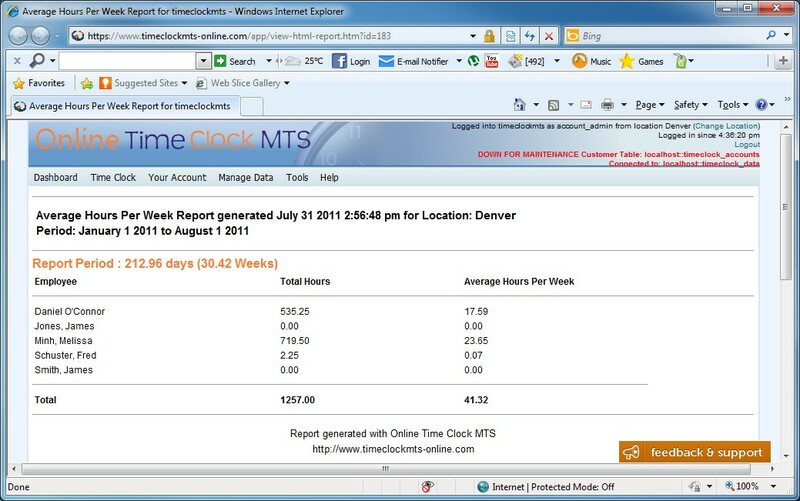 The average hours per week report. 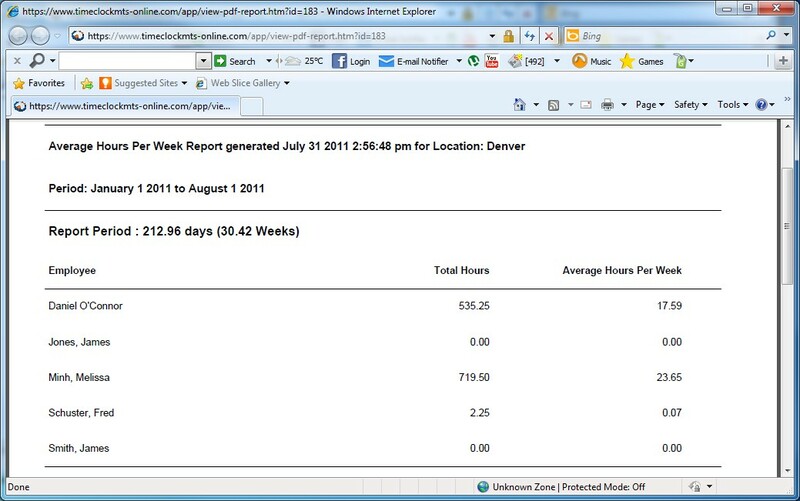 The PDF version of the average hours per week report. 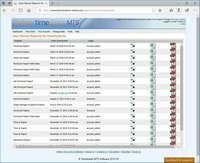 The badge number report gives you an easy reference list of your location employees, their badge numbers, and their PIN's. The PDF version of the badge number report. 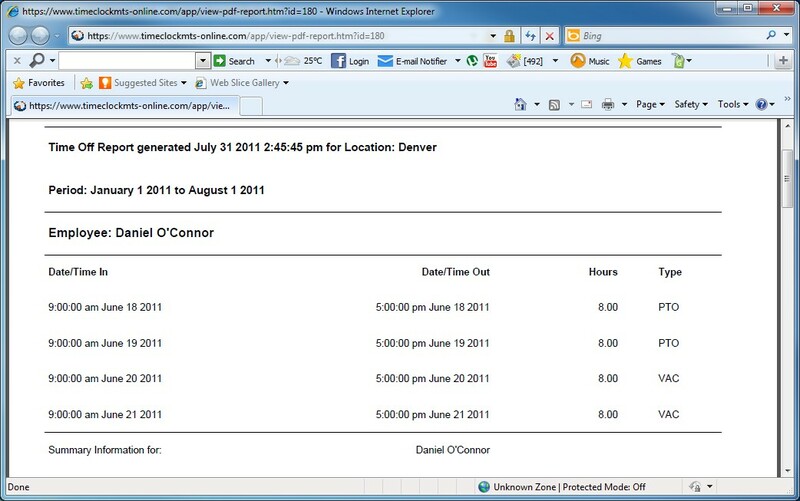 The detailed punchcard report gives you exact time details for every employee punch during the selected report period. The PDF version of the detailed punchcard report. 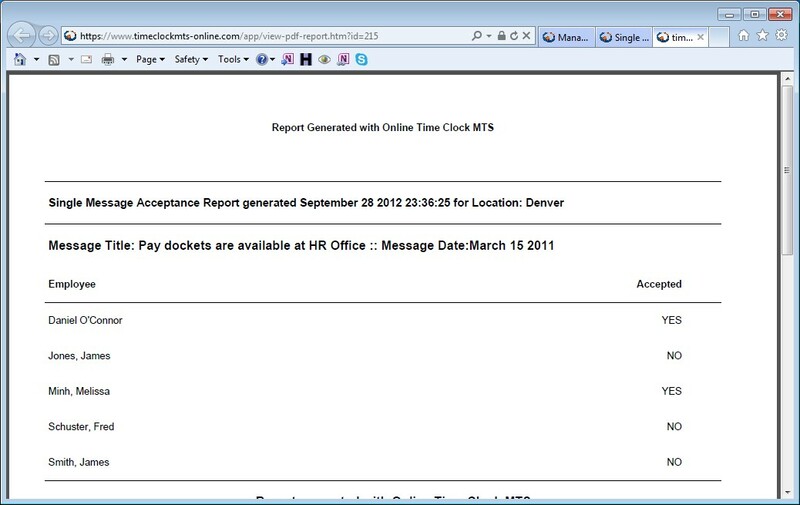 The job punchcard report breaks down each clock in/out for an employee by the job they have assigned the time to. The PDF version of the job punchcard report. 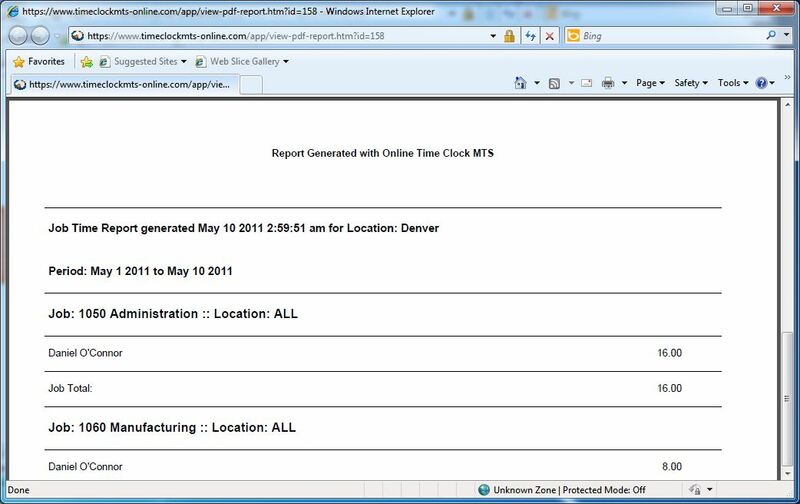 The job time report gives the total time spent by each employee working on each job over the reporting period. 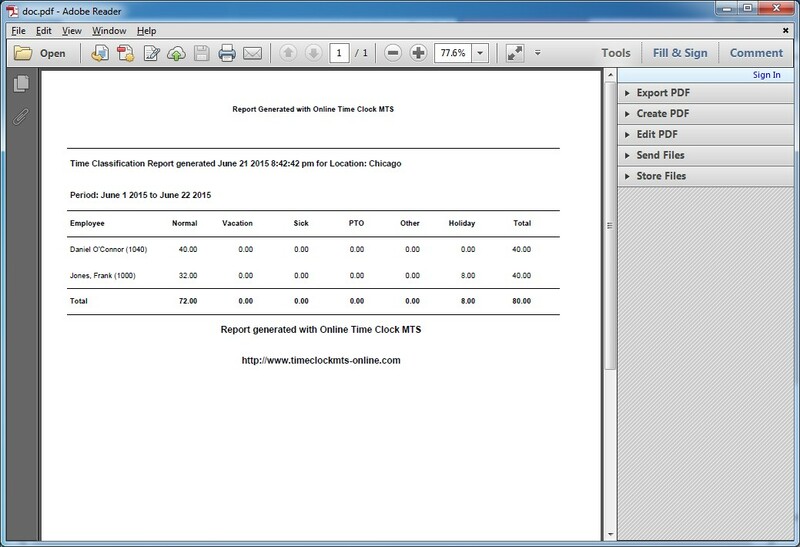 The PDF version of the job time report. 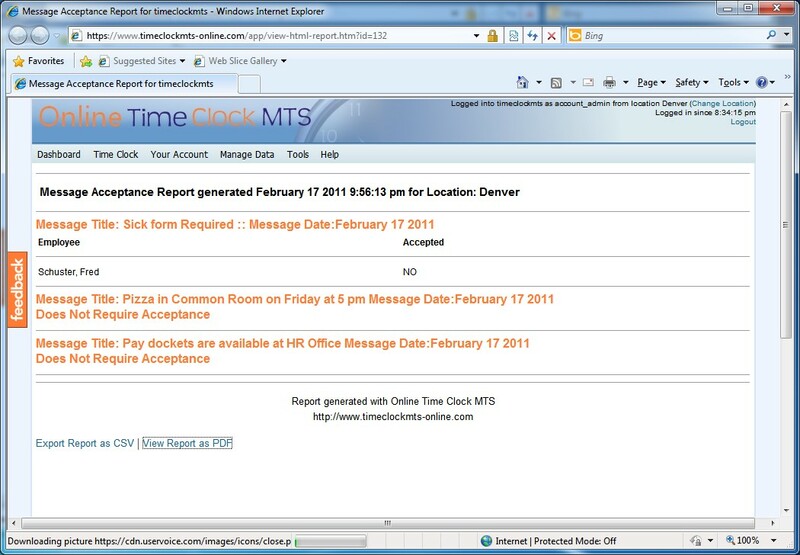 The message acceptance report gives you a report of which employees have acknowledged that they've read a message that administrators require them to. 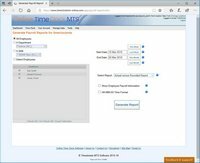 The PDF version of the message acceptance report. 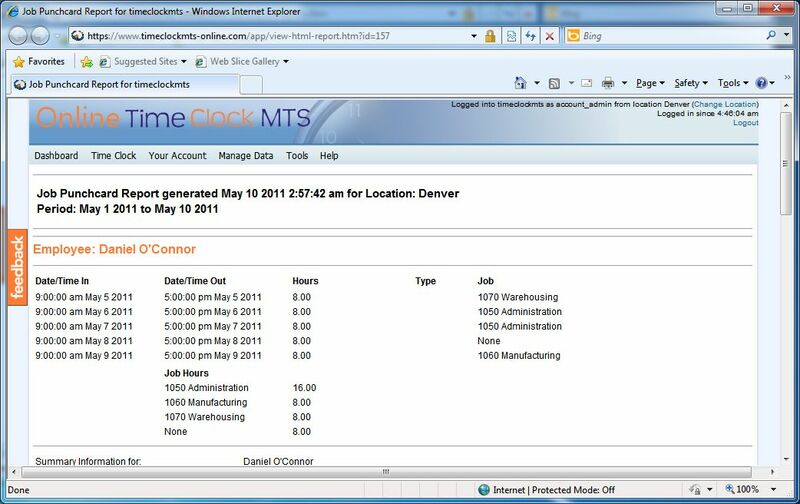 The missing punches report gives an easy to read list of all the employees who have a clock in without a matching clock out. 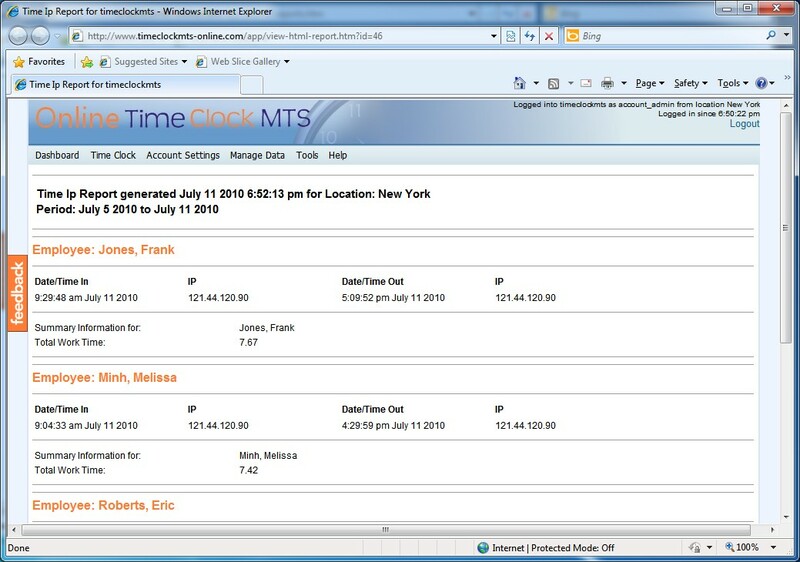 This allows you to see who has not clocked out very quickly and easily as well as allowing you to fix up any timesheet problems. The PDF version of the missing punches report. 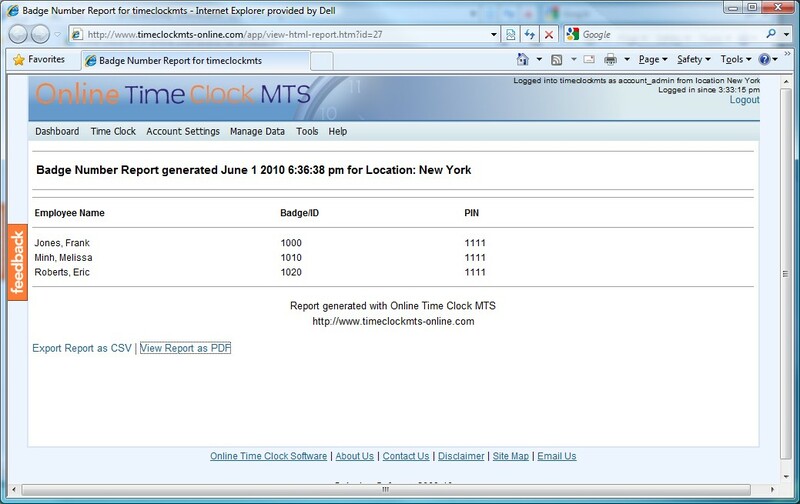 The punchcard report gives you a listing of the clock in/out pairs along with the elapsed hours between each for the selected report period. The PDF version of the punchcard report. 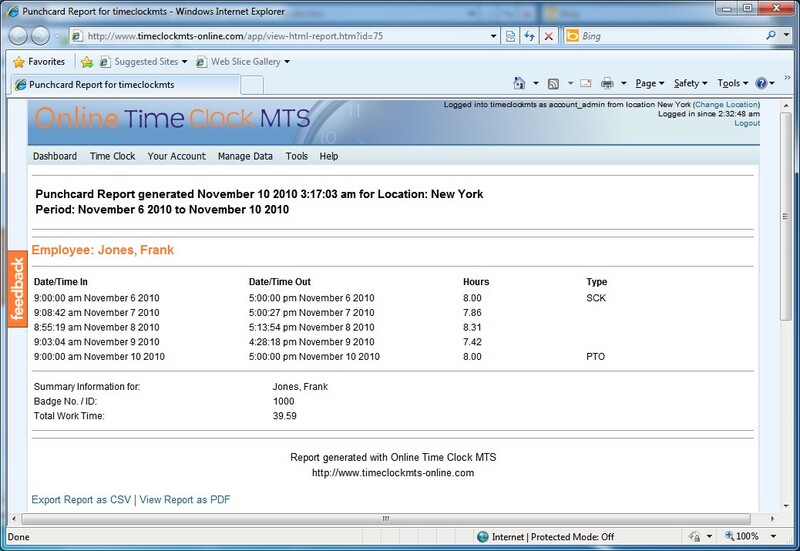 The simple time report gives a table of the different types of hours worked for each selected employee during the reporting period. 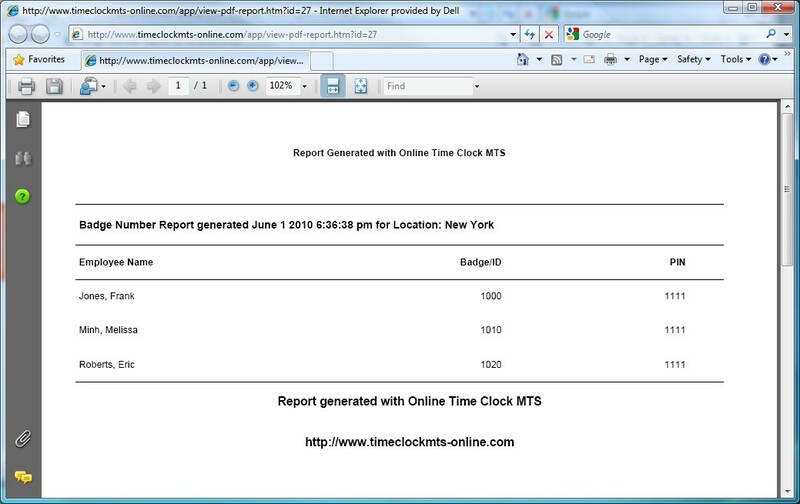 The PDF version of the simple time report. 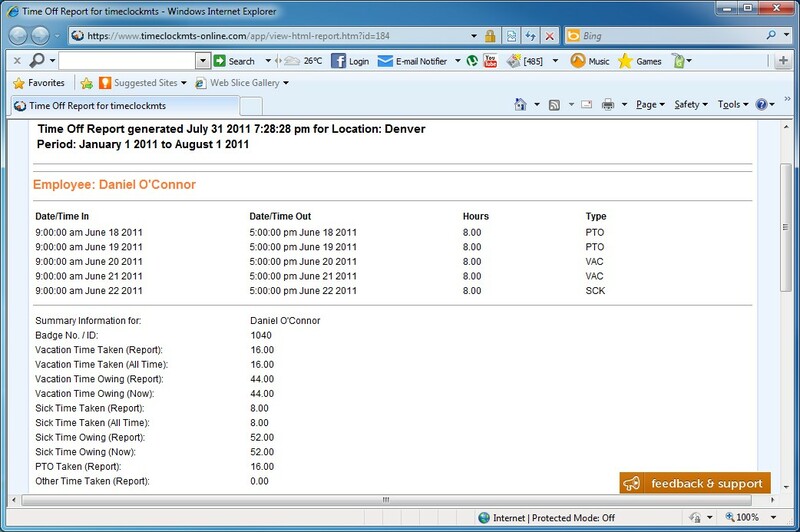 The simple wages report gives a table of the different pay classifications and total wages for each selected employee during the reporting period. The PDF version of the simple wages report. 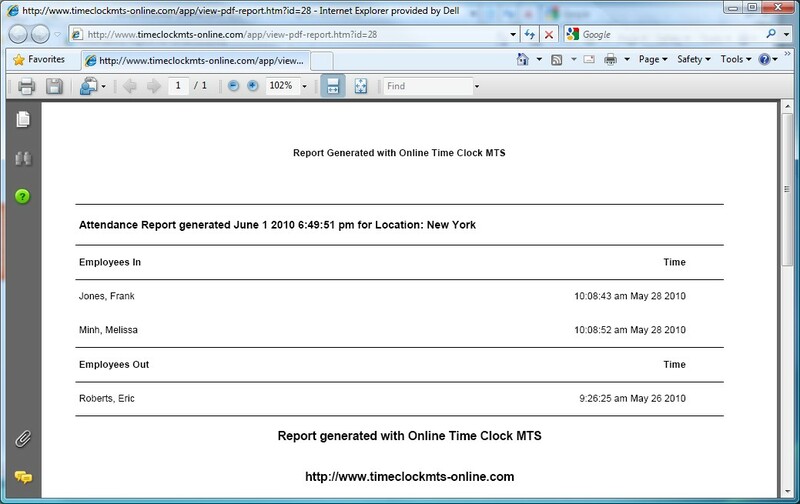 The Time Classification report summarizes the time reported by an employee by clasification. 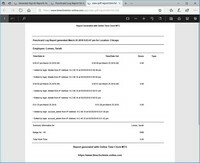 Available classifications are Normal, Vacation, Sick Time, PTO, and Other. 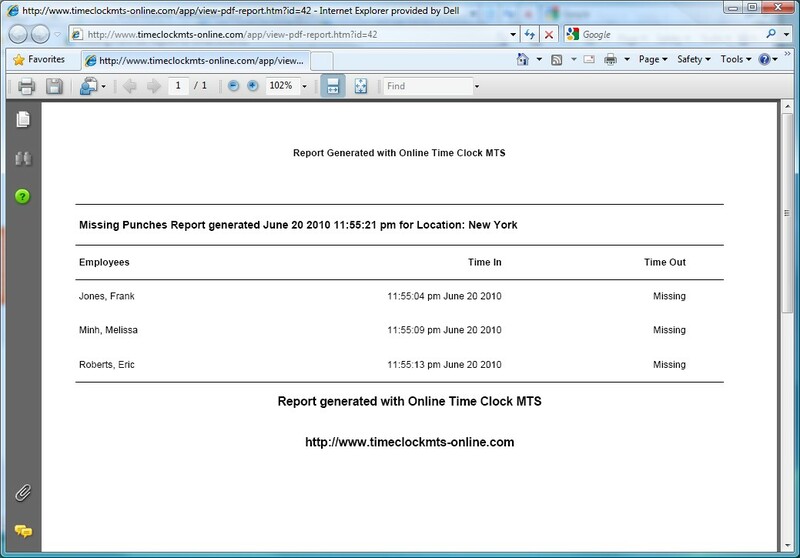 The PDF version of the Time Classification report. 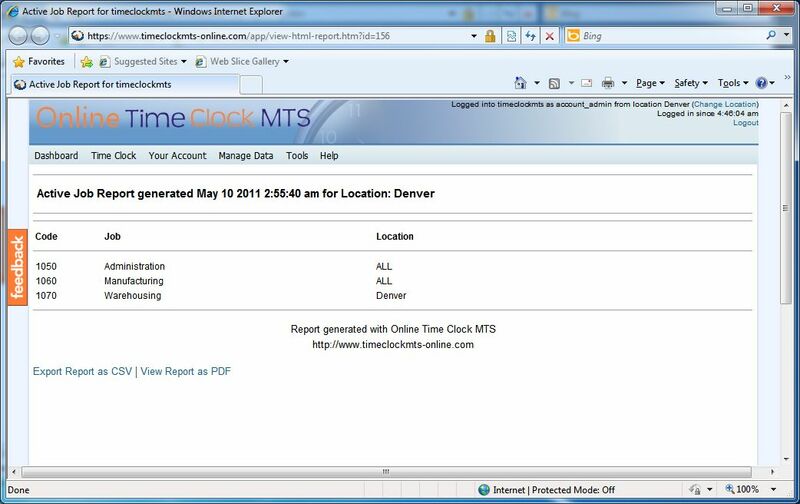 The Time IP report lists the computer IP address used when the employee clocked in or out along with the matching times. 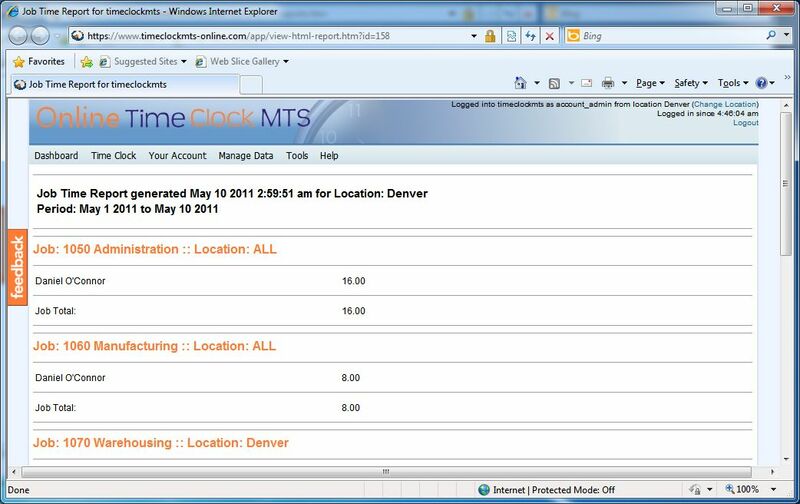 Useful for determining if an employee has been clocking in or out from an unauthorized location. 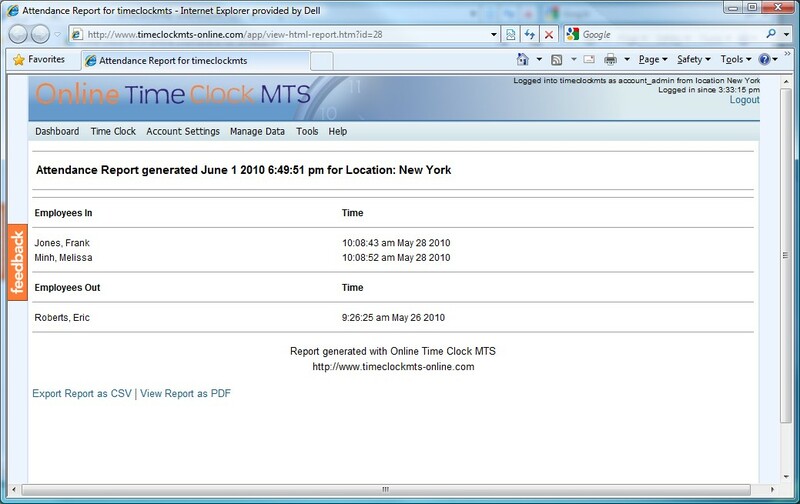 The PDF version of the Time IP report. 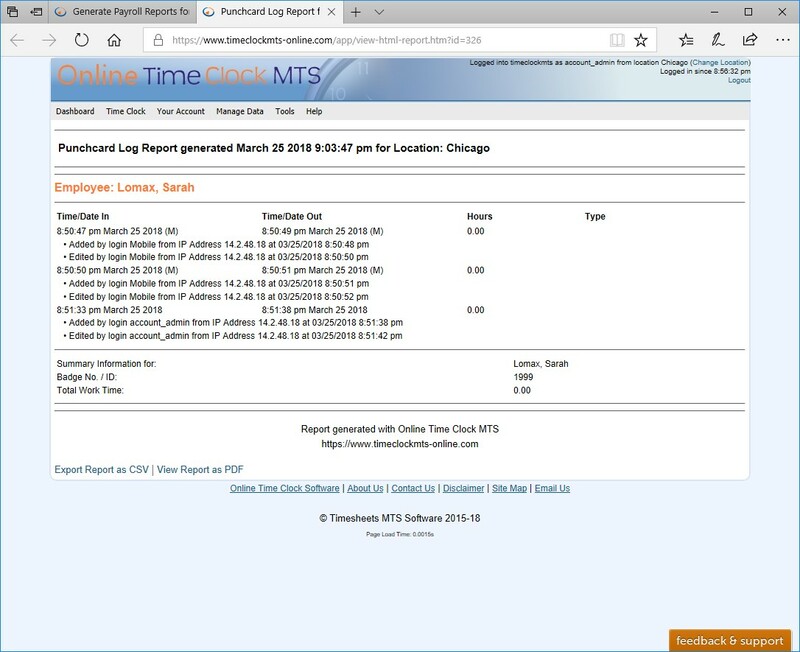 The Time Off Report displays all time taken off by the employee over the reporting period and gives a summary of the current state of employee accruals. 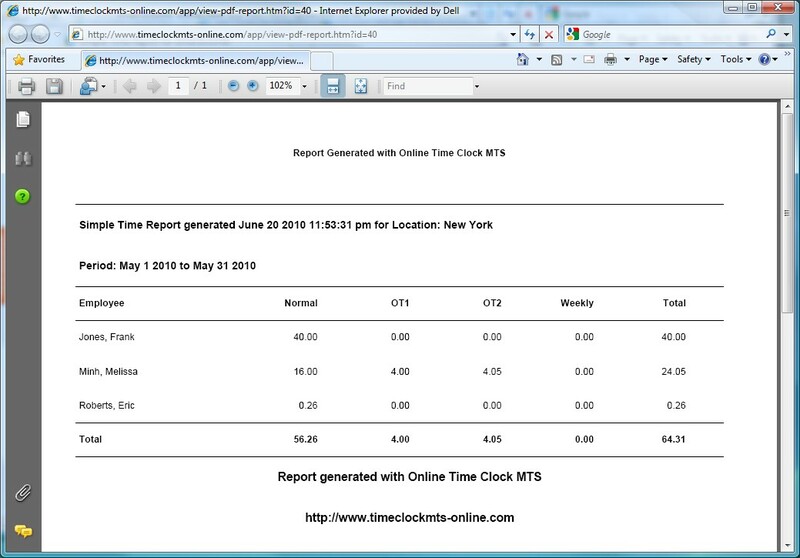 The PDF version of the Time Off report. 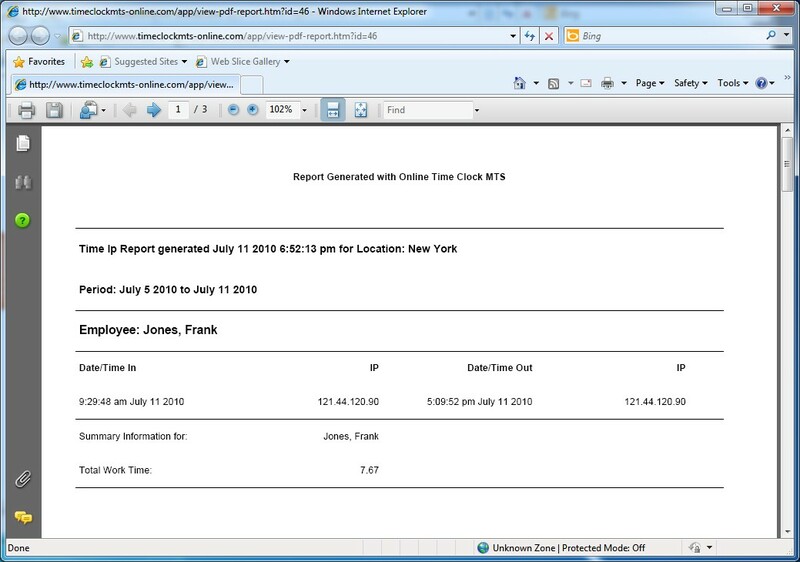 The PDF version of the employee note report. 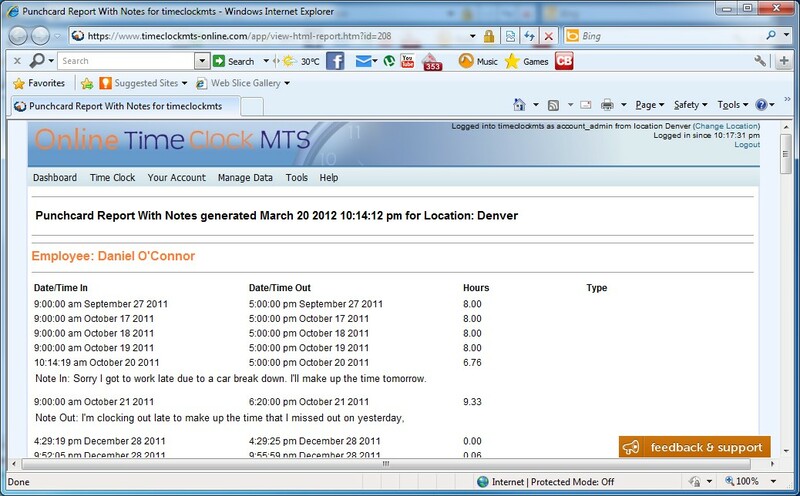 The punchcard with notes report shows clock in / out details along with employee notes. The PDF version of the punchcard with notes report. 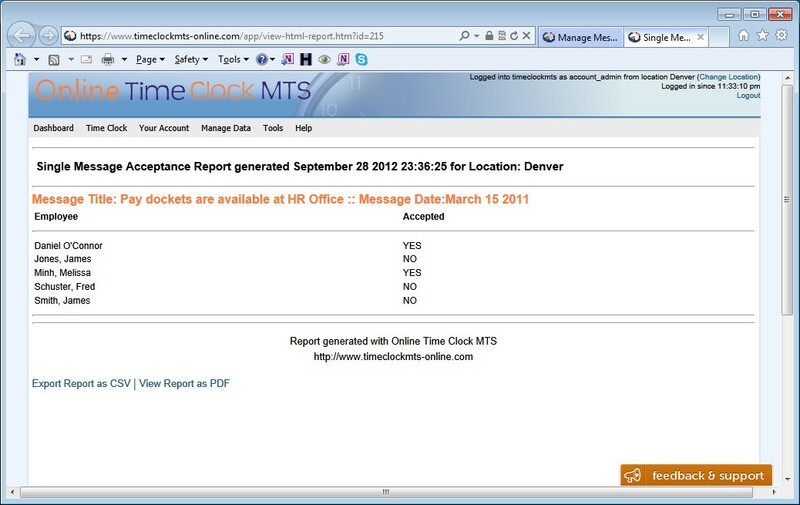 The single message acceptance report shows the employees that have or have not viewed a message. 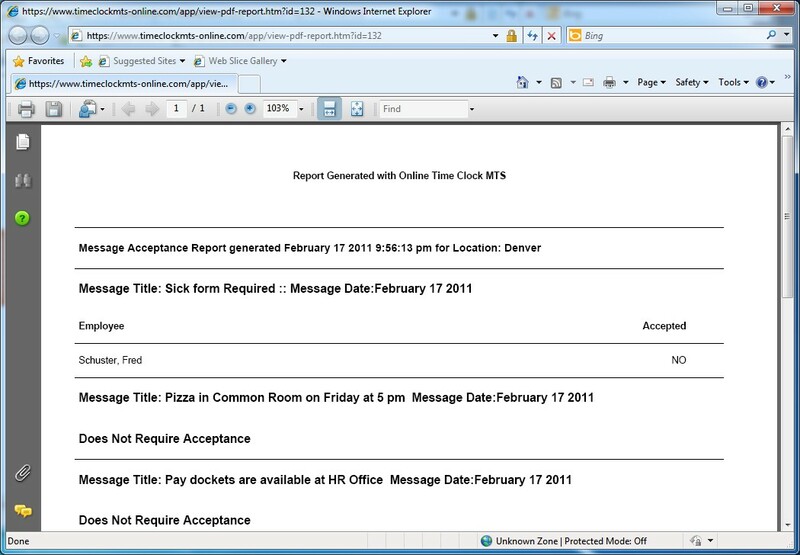 The PDF version of the single message acceptance report. 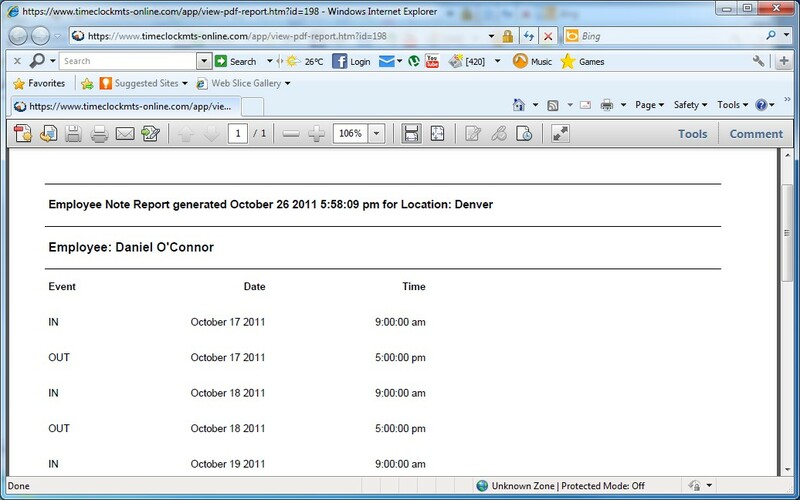 The Punchcard Log Report shows a log of events against each time punch showing you an audit trail for each time punch. The PDF version of the Punchcard Log Report. 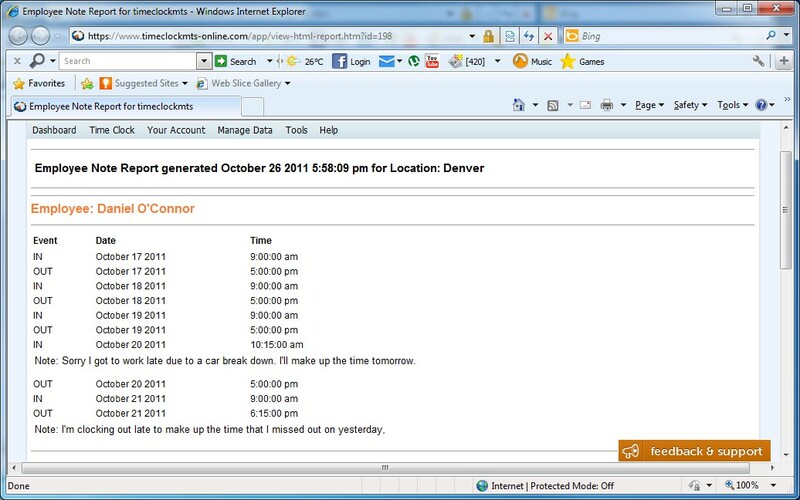 The time punch map plots time punches on a map showing where the employee was when they clocked in or out..